Hi You might want to adjust the northern counties i live in 5 Bed detached house in Leitrim/ Dromahair. In my street there was a 4 bed detached house with tax relief sold for €92,500 according to your formula i work out that my house is worth € 167,096.00 problem with that is whilst i would jump at some one offering me that money to buy it i doubt i would get it, as a new 5 bed detached in same village with 10yrs tax relief is selling for € 130,000. Thanks for the comment. The model is not one that can be adjusted manually, as it’s the culmination of thousands of individual sellers’ expectations. One issue that your example raises and which is easily dealt with in a full model (this is just a starter) is, within rural counties, the difference between town and county properties. Town homes are on much smaller plots and, particularly with estates, are of a significantly lower value than their county brethren. I should have explained – Dublin 18 is bundled in with South County Dublin (for legacy reasons). Naturally a fuller model could distinguish between the two, although homeowners on the fringes of the area tend to be relaxed about whether to include it or not. Useful tool for people given the lack of advice from our Government. Quick question, would you place a 3 bed duplex as an apartment or 3 bed semi for the purpose of this calc? Good question! Given it’s three-bed, probably semi-d (I’m guessing it’s over two floors and so feels more like a house than an apartment). But perhaps look at both figures (taking it as an apartment and as a semi-d) and you might get a sense of the bounds of its value. Just a comment on Paul’s query. A duplex would more than likely have management fees associated with it, while 3 bed semi’s mostly do not have this additional cost. Therefore impacting on the valuation, due to the additional yearly outgoing. Very interesting work, as always, and i look forward to your more expanded model. Looks like you are valuing the most expensive house in Ireland at €818,000. Please tell this to the Sherry Fitz salesmen and women who are still hawking south dublin properties for €1-3M. It’s worth pointing out that a good chunk of the variation in house prices that remains unexplained will be the kind of factors that are in very scarce supply (Victorian homes, stunning views over Dublin bay, close to a DART or Luas stop, large urban gardens… and of course all of these things combined). One of the reasons people like me were arguing in favour of a site value tax instead of market value tax is that market value taxes are toughest to get right at the very end of the spectrum you want to get right: the wealthiest in society. 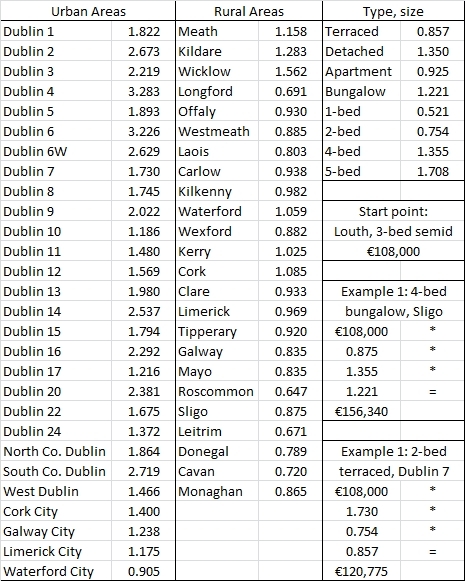 Models find it very tough to predict a house is worth €2.5m if only the top 0.05% of homes are worth that. It’s a lot easier to figure out where land is very valuable, though, and impossible for someone to disguise the fact they own half an acre in Killiney. Love the table, but I cant see the most common property type, semi-detached listed?? If i choose terrace instead of detached, there is quite a difference. Thanks for putting this together and congratulations on your continued success with DAFT. May I ask, why is the multiplier for an apartment higher than a terraced house? I own a 3-bed terraced townhouse and I would have thought it was valued more than an adjacent 3-bed apartment. However, using your figures this is not the case, unless I am missing something. Is this correct? I would have though a 3 bed house (terraced or not) would be of higher value than a 3-bed apartment? The one thing that is certain with properties is that property tax will rise and rise and rise now that politicians have got their claws on a new tax. My two bedroom flat in a nice part of Brighton is rated at £3000 a year council tax and £875 for water. However it’s sale price is rising at 6% per year. I live in North West Meath near the Cavan and Westmeath borders and I would suggest there is a vast difference between the value of property in this area and those in the Dublin end of Meath but the calculator does not allow for that.